In the fall of 1972, a neighbor called upon me to remove a large colony of honeybees from the wall of his farmhouse. He granted permission to remove wall boards in order to expose the beehive. He wanted a live bee removal, followed by the replacement of the wood. My reward was the bee colony, along with the honeycombs between the studs of his structure. 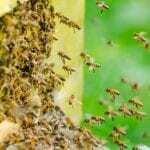 It took about a week to complete the removal of nearly 200 pounds of honeycombs and 25,000 ill-spirited, dark-colored bees. Since my carpentry skills were not yet honed, I paid a contractor to replace the wood siding. There were some unforeseen challenges to this first beehive relocation, but the satisfaction was extremely cherished. 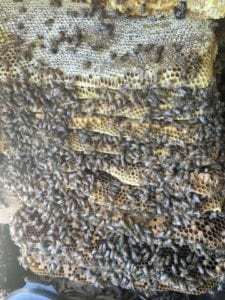 The bee colony was placed in a homemade wooden box. It was relocated to a woody clearing near my home. I gave the colony a few days to get settled before I approached them for observation. The field bees were seen hurriedly departing and arriving to the hive; their membranous wings glinted in the fall sunlight. The autumn forest sported an array of reds and golds. This deciduous process, along with a decreasing photoperiod, stimulated the bees to store as much food as possible. Soon, frigid winds would bring foraging to a close. Without sufficient stored honey, the bee colony would have died. As Indian summer lingered, Clusters of asters yet bloomed along roadsides and foxtail goldenrods waved to a cool wind in the meadows. Thanks to these vestiges of fresh nectar and the honey from the wall of the farmhouse, the honeybees were well prepared for a successful relocation.